A visit to my local roadside stand tells me the seasons are beginning to change. Sure, there are still tomatoes and cucumbers and squash, but now we see the first autumn apples and crisp Asian pears. Soon there will be fragrant apple cider and pumpkins of every color and stripe. I love combining local produce to bridge the seasons, as with this spring’s Asparagus and Shiitake Stir Fry, marrying the tender spears of spring asparagus with the last of winter’s butternut squash. I also like to appeal to all the senses with my salads, bringing together crisp, sweet, sour and tart, with emphasis on the crisp and heavy on vibrant color. 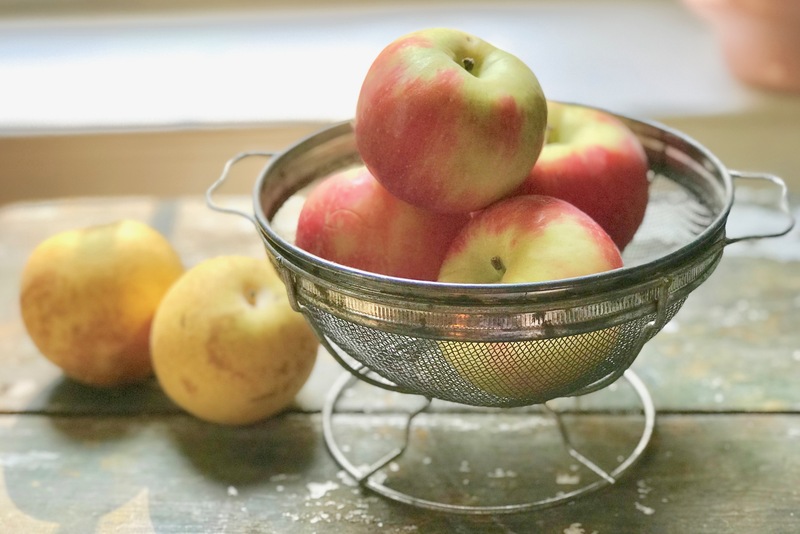 That’s what will be on your plate with this autumn fruit salad, drizzled with a lively mustard vinaigrette to temper the sweetness of the apples and pears. Did you know cucumbers are technically a fruit? Me, neither! Tomatoes I knew belonged in the fruit family, although when we admonish kids to eat their vegetables, tomatoes are pulling double duty in the vegetable world. Recipes that don’t involve heat are always welcome in my house. I love to cook and love the process, but if there are other cooked items on the menu, isn’t it nice to have an item or two that involve only chopping and assembly? If you’re serving this salad to guests, remember that folks really love to help the hosts —it makes them feel useful and part of the family—so put them to the task of slicing and chopping. The vinaigrette may be made several days ahead of time. A pretty platter and a nice set of serving utensils, and there you have a colorful dish bringing summer and autumn together with a communally produced showpiece of a salad. For vinaigrette, whisk together mustard, garlic, salt, pepper and vinegar in small mixing bowl. Gradually whisk in olive oil; may be made one week ahead of time; bring to room temperature before serving since olive oil will thicken on refrigeration. Arrange all fruits plus red onion on large platter and just before serving, drizzle vinaigrette over all. Avoid making ahead since vegetables will not stay crisp. This salad would make a great base for grilled protein. Wish I could make you a nice platter right now!